Rawr! 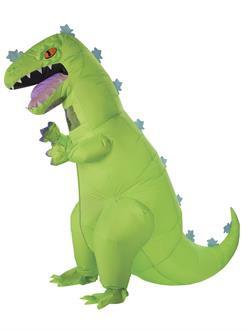 If you loved the Nikelodeon cartoon Rugrats as a child, you’ll love our Rugrats Adult Inflatable Reptar Costume! Who wouldn’t want to be the most iconic cartoon dinosaur that Tommy, Chuckie, Phil and Lil looked up to? Impress your friends for Halloween by going trick or treating in our Rugrats Adult inflatable Reptar Costume. The Reptar jumpsuit comes with two battery powered fans (batteries not included) so you can stay cool while celebrating Halloween. Shop a Rugrats Adult Inflatable Reptar costume.